This year at Ignite 2015, Microsoft spoke heavily about something called Office 365 Groups. The air time that Office 365 Groups seemed to replace the heavy rhetoric that Yammer consumed over the last few years. After leaving the conference, I kept thinking about what this does to Yammer. 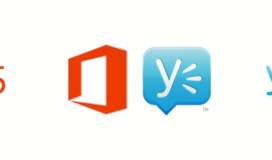 Is Microsoft trying to bring Yammer like features to its SAAS offering? It may appear that Microsoft’s messaging on this front is a little confusing, but I think it’s important to try to distinguish the proper use cases for Yammer and Office 365 Groups. 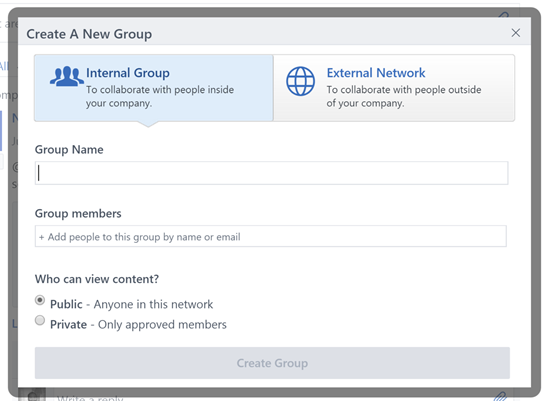 The best way I can find a relative difference between Yammer and Office Groups are internal and external. If you want to look at corporate calendars, collaborate on team sites while still within your own organization, I think Office Groups make a lot of sense, whereas Yammer is great for social collaboration outside of your organization. Both Office Groups and Yammer have the ‘reply to’ feature within newsfeeds, which in my opinion speeds up social collaboration on the go with just regular email. Yammer has always been the standard in user experience, and group creation in Yammer has always been easy and relatively intuitive. Yammer has always focused on ease, and since many users are familiar with Facebook, Yammer chose to use the same style. Yammer currently isn’t tightly integrated with OneDrive, SharePoint and other Office 365 features but it could be in the future. Some users may find Yammer easier to use because it doesn’t launch other document management specific features within its interface. Groups were rolled out to Office 365 users last year. The can be created, viewed, and managed within Outlook in Office 365 (OWA) and will be available on-premises in Outlook 2016. Users can create groups directly through the web interface for Outlook. The process for Office 365 Group creation is straightforward and intuitive, with pretty much no user training needs. I went ahead a created a few Groups and invited a few team members to join. 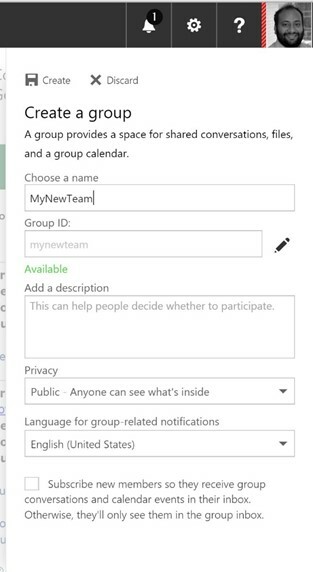 Once an Office Group is created, you can start a new conversation (group newsfeed), view group files or see a group’s calendar. Every feature in Office Groups uses existing Office 365 features, the ‘Group Files’ for instance just leverages OneDrive to store, share, and collaborate on files within the group. For many organizations social collaboration is still a growing concept, but email isn’t. Even with increased user adoption in Skype for Business and SharePoint, many people still rely on email for their preferred form of collaboration. This plays well for Office 365 Groups; they allow a user to stick with what they are used to in Outlook while adding group collaboration functionality. Yammer is required to use Yammer Groups, so for people that are used to social collaboration within Yammer, then Yammer is the way to go. The ease of use and the integration with out of the box Office 365 functionality will propel Office 365 Groups ahead of Yammer Groups. Everyone loves a single interface and Office 365 Groups provides just that. Next Agile Adoption, Part 2 – How do we start?